In a time when environmental activists are urging every American to make small changes, these PBS Mathline activities focus on mathematical investigations of earth-friendly practices, including energy usage and recycling. They provide real data and encourage students to follow the data trail through time in hopes that they will be prompted to take action. See What We Do Adds Up, a PBS lesson for Grades 4-6, prompts students to reflect on the average per person trash output and how it adds up over time. What's in a Bag?, a lesson for Grades 5-8, examines the use of paper bags and their impact on trees and landfills. Population Simulation with M&Ms, designed for Grades 6-9, suggests another way to use M&M candies in math, this time to model decaying populations. In Adventures With The Fish Pond: Population Modeling encourages students in grades 7-9 to write a NOW-NEXT recursive equation to model the M&M data on their calculators. See More Math Concepts from PBS Mathline resources for additional real-life applications of math concepts. Consider using some of these activities to incorporate earth-friendly data and practices into enriching math activities. Planting Trees examines data on how many trees would be needed to undo the carbon dioxide emissions of a single family car, given the yearly mileage. Math Hunt: Earth Day uses mathematical data to explore environmental issues. Scholastic's Think Green Cyberhunt develops environmental awareness in young students. 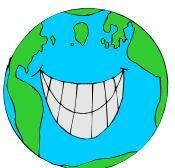 Consult Earth Day Network's Lesson Plans k for some mathematical suggestions to enrich Earth Day celebrations. Compact Fluorescent Bulb (CFL) Fact Sheet prompts math problems and solutions. Did you know that only 2 man-made structures on Earth are large enough to be seen from space? Can anyone guess what they are? The answers are the Great Wall of China, and the Fresh Kills Landfill! Check EPA Teacher Resources for activities and printed materials to use with students. Visit EPA's Climate Change for Kids for information on this current hot topic. See all Mathwire Seasonal Math Activities.